How does a musician go from classical pianist to Game Boy musician? Ask composer / sound designer / sound engineer Haeyoung Kim, who makes 8-bit music under the name bubblyfish. 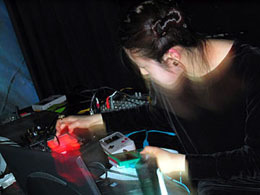 Check out Haeyoung’s site for lots of articles on her and Game Boy music-making in general, as reported by everyone from MTV to MSNBC. Here in New York, Haeyoung and I, among other composers, will be reimagining pianistic possibilities at a concert by downtown pianist Kathleen Supove, Tuesday through Thursday at 7pm at The Flea in TriBeCa. Piano duet with Game Boy? Check. Electronics generated live from the piano? Check. Video projections on the surface of the piano and live VJing? Check. Even Schroeder would be proud. For those of you in NY, drop me a line if you’re going to stop by; for everyone else, I’ll be back with some tips learned from the tech in this show.